Lord of the Rings: The Two Towers swings it's bloodied way onto the power of the XBox with some exceptional results! Don't be mislead however, this is strictly a nice to play beat em up as opposed to Role Playing Strategy game that most folks expected. 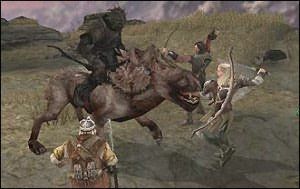 Being a fully licensed title, LOTRTT incorporates a whole mess of actual footage from the movie that will have you watching on in awe. The brilliant thing about this is that the movie footage leads to gameplay with an almost seamless quality. In fact, the first time this occurred, I must confess that I didn't even notice the transition until I figured that some of the people on the screen were standing just a bit too still. 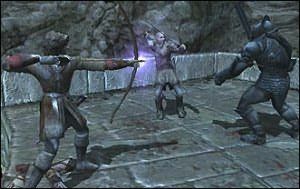 The game allows you to play the parts of three of the characters from the film, being our heroes Gimli the Dwarf, Legolas the Elf and Aragorn the Human. Each of this playable entities has their own unique fighting styles that will force players to alter the way they approach the game slightly for each one. The nice thing about the game is that despite the different fighting styles, they are all very easy to learn with only basic button presses needed to vanquish the enemy. You can buy combos later as you progress through the game, however from the outset it's all very easy. One of the coolest things that I have seen in some time, is when being attacked by archers, is the ability to parry their arrows that are shot at you. It looks great and is a wonderful thing to have incorporated into the game. Whilst these controls are pretty easy to pick up, they are not configurable, nor is there a controllable camera available to you, so be prepared to get hit by foes off the screen on occasion. In addition to that, there is only a narrow window through which you can progress in the game. By that, I mean that you cannot travel anywhere you like on the screen that you can see. There might be an open expanse but you are limited to the immediate area you are in at the time. It's a bit of a shame that you cannot go further as the landscapes look great and would be fun to explore. The title looks a treat, however having seen the game on the PS2 I would have to say that XBox came out of it second or third best depending on how GameCube shaped up (We've heard good things). It appears to be a fair bit darker and also some of the textures don't seem to gel together was well as they did on PS2 which is a shame considering what the XBox is capable of. The enemies on the title are well detailed and animated, doing justice to the film which should please many fans of the series who were hoping for as realistic a depiction of the movies as possible, the game certainly does not let you down. In fact, the only real disappointment there is the fact that the faces of the heroes is lacking somewhat. Of course you know who they are but it would have been lovely to have some spot on representation for the game. The audio on this title is the true shining point with it being in Dolby 5.1 and utilising a surround sound setup to decent effect. 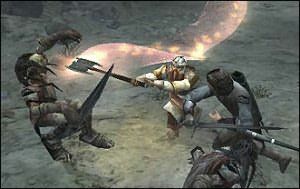 It is pretty cool to be fighting your way through your latest enemy and to hear the sounds of battle all around you. Very clever stuff. I did notice however when things intensified, that the music chopped a little bit at times. Not enough to ruin it, but enough to be noticed. 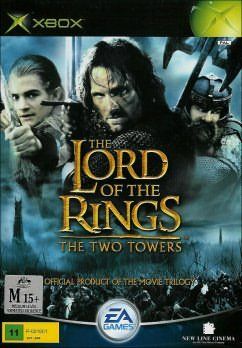 All things said and done, Lord of the Rings: The Two Towers is a cool game that does justice to the great movie it is licensed to. It's fun to play and despite several limitations, will be sure to be a title that any Tolkien fan would be more than happy to own. A lot of fun and recommended for fans of the books/movies, and those who like a hack n slash game with a swords and sorcery lean.